Emil Grunzweig was born in Cluj, Romania. His mother, Olga, was a survivor of Auschwitz. His father, Samuel, died in France in 1963. After France and Brazil, the family moved to Israel, where Olga settled with her two sons Emil and Eliezer in Haifa. There Emil attended the Reali High School. After graduation he joined a Nahal unit based at kibbutz Revivim in the Negev. As a paratrooper he served in the Six Day War in 1967, and went on to become a reserve officer, serving in the Yom Kippur War and the 1982 Lebanon war. After his discharge from the army, Emil settled at Revivim, where he worked in the orchards. He studied mathematics and philosophy at the Hebrew University of Jerusalem. He taught maths and coordinated social activities at Maaleh haBesor high school at Magen. He was involved in many educational projects including role-playing games with the students on issues such as the Arab-Israeli conflict, labor relations, and the relationship between religious cults and the state. He moved to Jerusalem to complete his Master's degree in the history, philosophy, and sociology of science, and worked in education projects at the Van Leer Jerusalem Institute. In this capacity, he organized joint Jewish-Arab summer camps to promote understanding between Jewish and Arab youth. As the marchers set out from Zion Square heading towards the Prime Minister's Office, a hostile right-wing crowd gathered along the way, shouting abuse, jostling and hitting demonstrators. 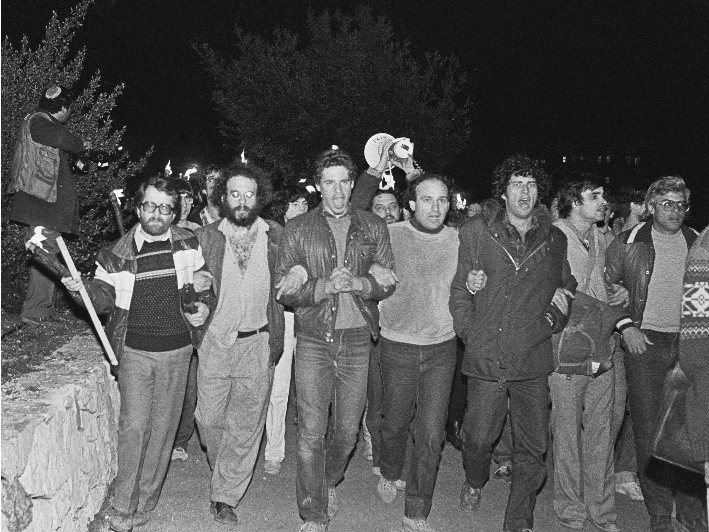 Then Yona Avrushmi, a right-wing actvist, threw a grenade among the demonstrators. Emil Grunzweig was killed. His friend and fellow ex-para Avraham Burg, son of a cabinet minister, was among those injured. The killer Yona Avrushmi was jailed for life, later commuted to 27 years. 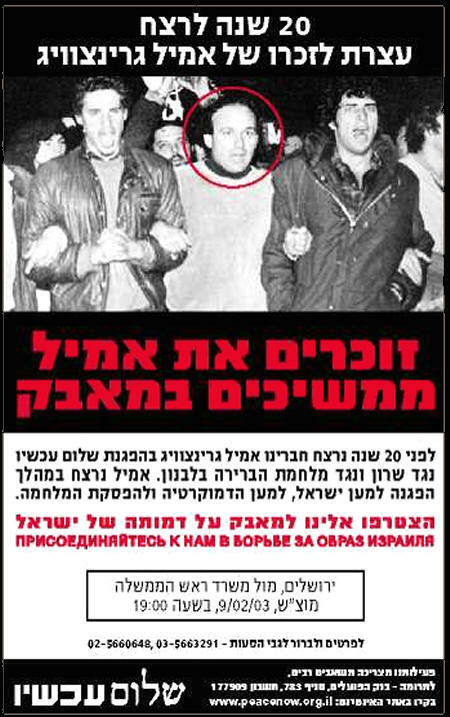 Paroled and released two years ago, he boasted that his action had finished Peace Now and the left in Israel. Did "Deep State" order Kurdish women's murder?